I finally got around to sprucing up the front porch this weekend and I’m loving it! Wish I could take the credit for making this wreath, but my big sis bought if for me from Costco of all places! I love the combination of feathers, berries, pine cones, and pomegranates. My Keeshond, Gandalf the Gray, had to get in on the action :). (Yes, I’m a total Lord of the Rings Nerd.) Gandalf makes for a great Fall and Winter accessory don’t you think? I found these yellow pillows for $6 each at Ollie’s. The original price tag on each said $72!!! Uh, what? Yellow flowers seem to smile happiness. I heart them. Sigh. Anyone want to come over and sip some hot cider or pumpkin latte on my porch? Well, come on over then! How about you? 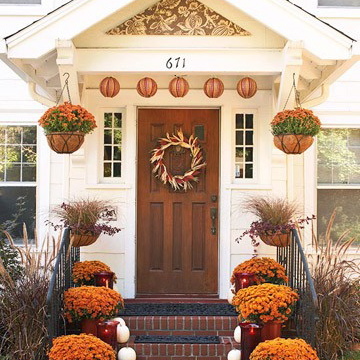 Have you decorated your porch yet? Well get your mantels (or fake mantels) decorated because Wednesday is a Halloween Mantel Linky Partay! HA! I’m not sure which I want more, the beautiful fall wreath … or Gandalf! i am on my way…i'll take a pumpkin latte, but first i've got to stop at ollie's in hopes of finding a few of those adorable pillows! looks fabulous, and i wouldn't expect anything less! PA is gorgeous this time of year…happy fall! I just found your blog this morning and when I saw the picture of your keeshond, just brought tears to my eyes…I had a keeshond as a little girl, her name was Angie, she was blind in one eye and scared of everybody but me. I loved her so much and was so sad when my parents sent her "to live on a farm where she would be able to run around…" Just really touched my heart this morning and had to share. first, your porch on it's own is amazing…and your decor is lovely! I love the pops of yellow…so fresh and not just typical fall! Your blog is just lovely! Your porch looks marvelous, and that wreath is amazing… gorgeous! LOVE your dog, like a big ball of dust bunny. He IS the perfect cold weather accessory. Sadly, I don't have a porch 🙁 but one is in the planning stage! yay! Lovin your porch and those darlin yellow ruffle pillows!! Too cute! Looks so nice and fall looking. Great job, love it. Could this be any cuter?!?!?!?! I love it! Oh and your Keeshond is beautiful! Oh this looks so beautiful! I love those American Porches and you 'do' yours so well!! And I finally got around to seeing your video for Layla and Kevin. Men your guys rock and especially yeah for your husband, that man has got some moves!!! (oh and you too 😉 ). Beth, your front porch looks awesome all deck out for fall. Especially loved seeing Gandalf….what a sweetie. P.S. What time is hot cider? Your porch looks so beautiful and festive! Gandalf is such a good dog; we got pumpkins this weekend for our porch, and they were demolished by our labs within 15 minutes! Ok, I love the wreath! Great Costco find. Wish I lived closer, would love to share some hot apple cider on your beautiful porch. Love those pillows! What is Ollie's? And that wreath is just amazing – I can't believe it's from Costco! Gorgeous, Beth! Your front porch is to totally die for. I really miss mine from my last home. I would LOVE to relax on that porch! I love the yellow! The pillows were a steal…I wish I had a covered porch. So inviting! Can I come over? I love your front porch. And it looks so beautiful decorated for fall. Yes, that wreath is fab. And I love the yellow flowers. What a steal on those pillows. Wow! Your porch looks great! Love how you tied all the colors together! Great score on the pillows! I love to go to Ollies to hunt for a great deal! So cozy and welcoming. I love those pillows!and the wreath! heck, I love it all! Girl, if I was anywhere close, I'd stop by & sit a spell. What a pretty porch, I wish I had a large front porch, but have to make due with my deck space. You did a fantastic job of Fallin' it up! That is just beautiful! I'm having this crush on yellow lately. I saw Sarah's House and she does a lot of yellows. Hummm…thinking of redoing the family room! Oh my, so inviting. I want to sit and read a good book. CRAZY about your wreath! I love how full and colorful it is! That porch is swoon-worthy! I love the gate you have across the stairs so Gandalf can't escape. The wreath is gorgeous…don't think I saw that one at our Costco. Love the pillows and the mums. Everything looks fabulous! Gorgeous! I love love love little pops of yellow!!! It just makes me smile! Ollies? A place for cute pillows that I do not know?? I don't think we have them in Cajun Country but if I ever see one I'll stop in. BTW, your porch is perfect!! Your porch looks wonderful! That wreath is just great (aren't sisters the best?) and I love your yellow flowers and pillows. But now I'm wondering–what is Ollie's? Maybe I could come over for a drink and you could tell me about it while we sit on your porch. So maybe you we really should visit one another. We could hang out on both porches! Shelley, Ollies is a discount chain. Not sure if they have them in Philly. I can't remember. But it's a great hit or miss kind of store for everything from books (fabulous Christian book supply) to food and crafting supplies. Wish I could be there! This looks like home to me…or what I wish home looked like for me. Love the wreath, and Gandalf…well he's just too cute! Love Keeshonds! Have a happy thanksgiving!! Looks lovely! Your flower baskets are the icing on the cake. Oooo, you should do a post on flower boxes (if you haven't already). I'd like to see a few examples of those. I wish I could get up the motivation to do something like this. We have such a cute flower bed in the front of our house that I always feel bad about letting go. How much do you think a once a week gardener would be? Maybe someone on Craigslist is willing to do it for dirt cheap. Hah. 'Dirt' cheap. Those yellow ruffle pillows are my favorite! One thing is missing though! Me on the porch visiting you! Love your porch….beautiful!!!! LOVE your porch and that amazing dog!! Here's my dilemma – I desperately want to decorate for fall but have zero money to do so. Even $10 is a stretch right now that I can't make happen. Do you have any free fall decorating ideas? beth, what is Ollie's? I love the pillows! My mantle is ready, but it looks the same as last year, LOL! Your porch looks like a spread in Country Living magazine, I heart!!!! All those colors together are divine. Gorgeous girl! Rocking in your chairs sounds lovely! Those ruffled yellow pillows are so cute!! I really feel bad for your neighbors. Who can compete with this gorgeous cozy porch? No one if they don't have a Gandalf. I Heart your Fall porch totally. It's all just fabulous and that pillow deal was amazing. The wreath from Costco was a total find! lol…Gandalf has a look like no other. I love the yellow pops of color! It looks fantastic, Beth! It looks so festive and friendly. I would love to sit on your porch and sip hot cider. Gooorgeous darling!! I am so in love with yellow right now. And that wreath is amazing!